He attempts to find a diner in town, and maybe a temporary job. The overconfident town sheriff Will Teasle (Brian Dennehy) does not welcome Rambo, judging the military hero negatively because of his long hair and scruffy look. Rambo disobeys the sheriff's order to stay away from town, as he has done nothing wrong to the community and he believes such banishment to be a violation of his freedom of movement, and most of all he is hungry. Rambo returns to town soon afterwards and is promptly charged for vagrancy and subject to harassment from the deputies. Colonel Samuel Trautman (Richard Crenna), Rambo’s former commanding officer, arrives. He suggests giving Rambo a chance to escape; if Rambo is allowed to slip away, he'll be given time to calm down and he can be arrested without incident. Teasle allows Trautman to contact Rambo through a stolen police radio, but Rambo refuses to surrender, stating that “They (the deputies) drew first blood not me.” and then hanging up. The authorities thus reject Trautman's recommendation for a wait-and-see attitude and continue the manhunt, and Rambo's subsequent rampage culminates him returning to town with guns and bombs from a commandeered Army truck. This results in the destruction of the sheriff's office and more of the town's main street. Rambo stands poised to eliminate the sheriff, but Trautman finally confronts Rambo face-to-face, and ultimately convinces his former soldier to surrender to the authorities. In the second installment of the series in 1985, Trautman offers Rambo his freedom if Rambo will return to Vietnam to search for American prisoners of war remaining in Vietnamese captivity. Marshall Murdock (Charles Napier), the official in charge of the mission, is portrayed as a corrupt political figure who doesn't want to expose the truth. Rambo is not to engage the enemy and instead is ordered to take photographs of a North Vietnamese camp, the same camp he himself had been held prisoner in, to prove to the American public there are no more POWs (prisoners of war) in Vietnam, although Murdock knows that there are. 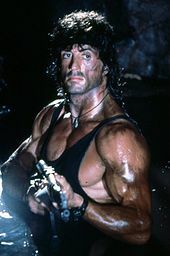 Rambo is flown into the country with the purpose of parachuting into the jungle, but a malfunction during his exit from the plane causes him to have to cut away much of his equipment. He then meets his in-country contact, anti-communist Vietnamese rebel Co Bao (Julia Nickson), who is serving as an intelligence agent. Rambo discovers that there are POWs being held in the camp where he was dropped and that POWs were rotated between camps. Rambo breaks one POW out of the camp and attempts to escape, only to be abandoned at the moment of a pick up by helicopter on a hilltop on the orders of Murdock and both he and the POW are recaptured by the Vietnamese soldiers. Rambo is immobilized in a pit of sewage and leeches, then tortured by Soviet soldiers, who are allied with the Vietnamese and training Vietnamese soldiers. Co enters the base under the guise of a prostitute for hire, where she aids Rambo in escaping. After Rambo expresses his deepest gratitude for his rescue, the two share a kiss, after Co implores him to take her back to America with him. As they prepare to move on, Co is shot down by surprise gunfire. Enraged, Rambo then acts on his own initiative and starts a one-man war, hunting the Vietnamese and Soviet soldiers searching for him in the jungle and stealing a Soviet-captured helicopter. He flies the helicopter back to the camp, destroying it and killing the remaining Vietnamese and Soviet soldiers in camp. He frees all the POWs out of captivity and is pursued by a Soviet Mi-24 Hind helicopter. After destroying the Hind with an RPG, he returns to the US base in Thailand with all the POWs. Rambo is enraged at how the United States government has ignored the existence of surviving soldiers being held captive, and grabbing an M - 60 machine gun proceeds into the headquarters building and destroys all of the electronic gear within. Rambo then threatens Murdock and tells him to be forthright with the American public regarding the truth of the POWs and to spare no expense in rescuing them all, or else he will return for Murdock. When Trautman says Rambo will be honored once again, he declines, saying the POWs deserve the accolades more. For his actions in Vietnam, Rambo is granted a presidential pardon and decides to remain in Thailand. The boat is stopped by pirates who demand Sarah in exchange for passage. After taking advantage of the pirates' complacency, Rambo kills them all. Although his actions save the missionaries, it greatly disturbs them. Upon arrival, Michael says that they will travel by road and will not need Rambo's help for the return trip. The mission goes well until the Burmese army, led by Major Tint, attacks the village, killing most of the villagers and two missionaries; one of the missionaries, a preacher played by James Wearing Smith  is spectacularly blown up in a Mortar (weapon) strike whilst preaching to a group of villagers. The vicious attack of the village by the Burmese army results in the remaining missionaries being captured. When the missionaries fail to come back after ten days, their pastor, Arthur Marsh (Ken Howard), comes to Rambo to ask for his help in guiding hired mercenaries to the village where the missionaries were last seen. Troubled by Sarah's potential fate, Rambo decides to accompany the soldiers. After seeing the destroyed village filled with mutilated humans and animals, the mercenaries spot some soldiers forcing several surviving villagers to run through a minefield. The mercenaries are hesitant to rescue the villagers, but not Rambo, who shoots the soldiers with a bow and arrow. Rambo reminds his colleagues of the rescue mission and encourages the team to move on. Hijacking a truck, they create a plan to save the hostages at the P.O.W. camp, doing so within fifteen minutes to avoid alerting the army. Rambo helps Sarah and the others to escape. The Burmese Army (Tatmadaw) unit finds their hostages missing and organizes a massive manhunt. Everyone except for Rambo, Sarah, and "School Boy", the mercenary team's sniper, is captured. Just as the group is to be executed, Rambo hijacks a truck-mounted .50-caliber machine gun and engages the Burmese army. A group of Karen rebels joins the fight to help Rambo and the mercenaries defeat the Burmese unit. Seeing that the battle is lost, Major Tint decides to flee, only to run into Rambo's machete, which Rambo then uses to disembowel the Major. In 2009, Stallone announced plans for a fifth film titled Rambo V: The Savage Hunt. The film would have been loosely based on Hunter by James Byron Huggins and would have focused on Rambo leading an elite special forces kill team to hunt and kill a genetically engineered creature. In 2011, Sean Hood was hired to write a new script, separate from The Savage Hunt, titled Rambo: Last Stand that Hood described was "more in line with the small-town thriller of First Blood". In 2012, Hood revealed that Rambo V was on hold while Stallone finishes The Expendables 2. Hood also revealed his uncertainty whether the film will be similar to Unforgiven or will be a passing-of-the-torch. In 2016, Sylvester Stallone revealed that Rambo V was no longer in production. By October of the same year, Milliennium announced plans to reboot the film series, with Ariel Vromen directing. Stallone would have no involvement. In May 2018 Rambo V was re-announced and scheduled to begin filming later that year in September, with the plot focusing on Rambo combating a Mexican drug cartel. Stallone confirmed to be co-writing the script with Matt Cirulnick, but is unlikely to direct. That same month, Stallone confirmed that the film is scheduled for a fall 2019 release. In August 2018, Adrian Grunberg was announced as the director. Principal photography began in October 2018. All four existing films in the Rambo series are available from Lionsgate by virtue of the studio's output deal with StudioCanal (the company that currently holds the underlying rights to the first three films) and Lionsgate itself co-producing the latter film (in partnership with The Weinstein Company). Paramount Pictures (via Trifecta Entertainment and Media) holds the television rights to the first three films, while Debmar-Mercury handles television distribution for the latter film on behalf of parent company Lionsgate. David Morrell, author of the original First Blood novel, wrote novelizations (book adaptations) for the first two Rambo sequels. Morrell has said that he wrote the novelizations because he wanted to include characterization that he felt wasn't in Rambo: First Blood Part II and Rambo III. Morrell did not write a novelization for the 2008 film, Rambo, as he felt the film's characterization matched that of the original First Blood novel. Rambo: The Force of Freedom was an animated series that ran in 1986 where John Rambo leads a team called the Force of Freedom to fight an evil organization called S.A.V.A.G.E. (short for Specialist-Administrators of Vengeance, Anarchy and Global Extortion). 65 episodes were aired. Rambo and the Forces of Freedom spawned a line of toys. In the late 1980s, Blackthorne Publishing published a few comics starring the character. One, titled Rambo III, adapted the film of the same title. Also, there was a comic simply titled Rambo featuring other adventures of the character. Rambo III was also published in a 3D version by Blackthorne. On August 21, 2013, it was announced that Entertainment One, along with Avi Lerner and his production company, Nu Image, are to develop and produce a Rambo TV series and that Stallone is in talks to join the project. However Stallone's press representative has denied reports that Stallone will reprise Rambo on the small screen. On December 1, 2015, Deadline reporting that Fox were developing a Rambo TV series titled Rambo: New Blood with Stallone reprising his role as Rambo, while he, Lerner and Jeb Stuart will executive produced the series, Stuart will also be penning the script. The series will explore the complex relationship between Rambo and his son, J.R., an ex-Navy SEAL. Fox chairman and CEO Dana Walden has stated that Stallone is off as the producer of the series. Rambo – action RPG based on Rambo: First Blood Part II. Developed by Pack-In-Video for the MSX. Super Rambo Special - Released for MSX2. Rambo III – Various games released for Amiga, Amstrad CPC, Arcades, Atari ST, Commodore 64, DOS, MSX, Master System, Sega Genesis, and ZX Spectrum. Rambo - Sega 2-player light gun game. Rambo: The Video Game - Released in 2014 for PC, Xbox 360, and PlayStation 3. Rambo: The Mobile Game - Released in 2015 for iOS devices. Rambo is a character in Fight Klub, a trading card game published by Decipher, Inc in February 2009. Soundtracks with music from the films were also released. The soundtracks for First Blood, Rambo: First Blood Part II, and Rambo are available on iTunes. However, the soundtrack for Rambo III is not available on iTunes. For more on the music of the Rambo series, see the "Music" section below. In early 2016, Siddharth Anand was announced as the director and the film will be co-produced by Anand, Daljit DJ Parmar, Samir Gupta, Hunt Lowry, Saurabh Gupta and Gulzar Inder Chahal. The film will specifically remake First Blood and will follow the last member of an elite unit in the Indian Armed forces returning home only to discover a different war waiting for him, forcing Rambo to the jungles and mountains of the Himalayas and unleash mayhem and destruction. In May 2017, Tiger Shroff was cast in the role of Rambo while production was schedule for a late 2018 release date. By October 2017, the film was placed on hold while Shroff and Anand complete other projects. The original scores for the first three films were composed and conducted by Jerry Goldsmith. The music from the first and second films was performed by the National Philharmonic Orchestra and the music from the third by the Hungarian State Opera Orchestra. Goldsmith's main theme for Rambo was the basis for the end title song "It's a Long Road", performed by Dan Hill, part of the First Blood soundtrack. Because Goldsmith died in 2004, film composer Brian Tyler (The Expendables and The Fast and the Furious films) scored the fourth film. He reassured fans at the time of Goldsmith's death that his score would be based on Goldsmith's cues for the first three First Blood / Rambo pictures. The 2008 film, Rambo, was advertised with Drowning Pool's "Bodies" and features two songs in the film written and performed by Jake La Botz, who portrays the mercenary "Reese" in the film. The theme music for 1986 animated TV series, Rambo and the Forces of Freedom, came from a trailer for Rambo: First Blood Part II, whilst additional music was composed by Shuki Levy and Haim Saban. Hunter, a novel which Rambo V was originally to be loosely based on before changes. The Intruder, an Indonesian film based on Rambo. Son of Rambow, a comedy-drama film that references Rambo. ^ "'Rambo' Reboot in the Works With 'Criminal' Director (Exclusive)". Hollywoodreporter. October 28, 2016. Retrieved 2016-10-30. ^ Vlessing, Etan (August 21, 2013). "Sylvester Stallone In Talks For 'Rambo' TV Series". The Hollywood Reporter. ^ Knox, David. "Reality Bites as Sly Stallone refuses to play Rambo". TV Tonight. ^ Andreeva, Nellie (December 1, 2015). "'Rambo: New Blood' Father-Son TV Series In Works At Fox With Sylvester Stallone". Deadline. ^ Topel, Fred (January 15, 2016). "'X-Men' Spinoff 'Hellfire Club' May Premiere Early 2017; Plus a Minor 'Rambo' Update". /Film. ^ Rambo Arcade Game - Kotaku. ^ JC Fletcher. "Rambo: The Video Game to emerge from the jungle at Gamescom". Engadget. ^ Rob Hearn (September 15, 2015). "Rambo: The Mobile Game - I came here to rescue you from him". Pocket Gamer. Steel Media. Retrieved September 20, 2015. ^ Burwick, Kevin (October 12, 2017). "Bollywood's Rambo Remake Gets Indefinitely Delayed, What Happened?". MovieWeb. Archived from the original on February 14, 2019. Retrieved February 14, 2019. ^ "First Blood (1982)". Box Office Mojo. ^ "Rambo II (1985)". Box Office Mojo. ^ "Rambo III (1988)". Box Office Mojo. ^ "Rambo (2008)". Box Office Mojo. ^ "Rambo Moviesat the Box Office". Box Office Mojo. ^ "Rating for First Blood". Rotten Tomatoes. Fandango Media. Retrieved 2011-07-31. ^ "Rating for Rambo: First Blood Part II". Rotten Tomatoes. Fandango Media. Retrieved 2011-07-31. ^ "Rating for Rambo III". Rotten Tomatoes. Fandango Media. Retrieved 2011-07-31. ^ a b "CinemaScore". CinemaScore. Retrieved January 27, 2019. ^ "Rating for Rambo". R otten Tomatoes. Fandango Media. Retrieved 2011-07-31. Look up Rambo in Wiktionary, the free dictionary. This page was last edited on 24 April 2019, at 07:44 (UTC).